Legacy Underwriters in Florida knows that a Ship repairer needs to cover loss or damage to vessels at all times while in their care, custody and control including while being worked upon, being shifted in tow or otherwise or on trials. Sudden and accidental Seepage & Pollution. At Legacy Underwriters, our Ship Repairers Liability (SRL) insurance is designed to provide cover against liabilities arising from acts of negligence which result in loss or damage to the property of others whilst being worked upon at the yard or personal injury to others while visiting the yard. 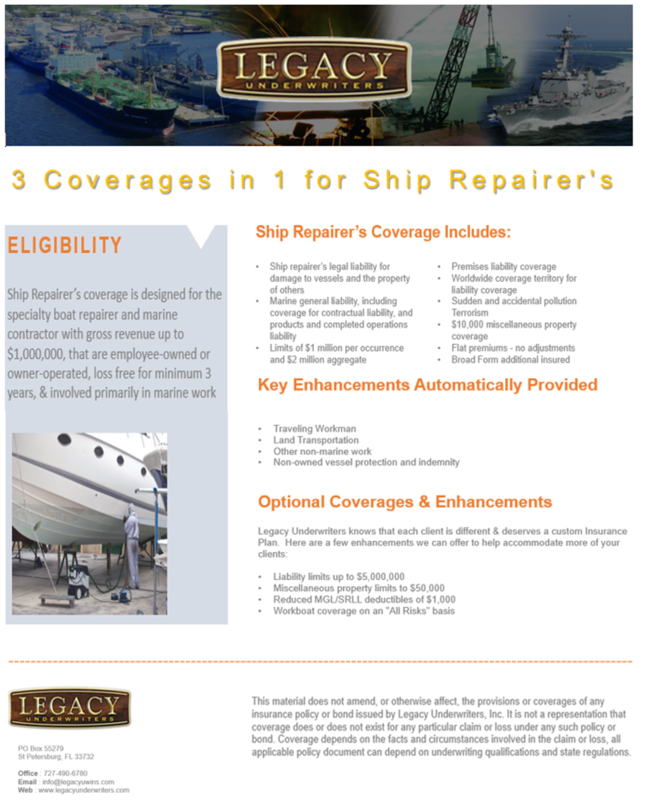 Depending on needs, Legacy Underwriters can also develop comprehensive package to provide coverage for ‘non-marine’ liabilities, including cover for general third party exposures for loss, damage and injury not directly related to ship repairing operations and product guarantee to cover ongoing liabilities arising from specialist repair or modification work. Steve Cunningham grew up in the Northeast area of St. Petersburg. He graduated from Florida State University (FSU) with a degree in Insurance and Risk Management. After spending five years with the marine department at Chubb & Son, Steve established Tampa Bay Underwriters, Inc., a full service marine insurance agency, in 1983. He has created multiple marine programs with his underwriting partners and has successfully grown not only size, but also in reputation. Steve brings over 38 Years of experience in Marine-Related Insurance to Legacy Underwriters as a founding member.